Custom Imprinted Sun Ray Matte Sunglasses are a good option for making your summer-time promotions striking. As these custom Oahu sunglasses are available in a good selection of cool colors, they can make parties and promotions colorful. 1.25" H X 6" D overall size, UV400 protective lenses and 0.38" H x 1.50" W imprint space are main characteristics of these customizable new arrival sunglasses. Order these classic folding eye wear made of plastic quickly to gain free online proofs, free design and no payment required until artwork approved. 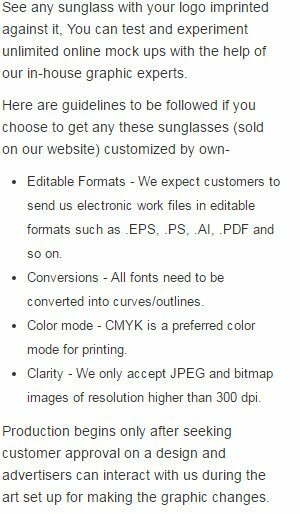 Request a quote to know savings that you can pocket on bulk ordering these Custom Imprinted Sun Ray Matte Sunglasses. Additional Information: UV 400 protective lenses, Classic folding eyewear.